Why is gastroenterology care so important? Let's start with Acid reflux (GERD). Approximately 25% of the population suffers from heartburn daily or more often and approximately 45% have heartburn once or twice a week. 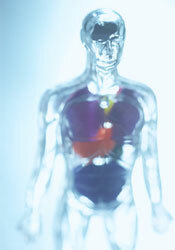 Acid reflux is treatable with powerful medicines, and there is no need to suffer from it. Chronic heartburn can be a risk factor for esophageal cancer, and a simple upper endoscopy can detect your risk. How about Irritable Bowel Syndrome? Have you suffered from abdominal pain, bloating, constipation or diarrhea? About 10-15% of the population suffers from IBS. Though there is no cure for IBS, good and emerging treatments can do a lot to relieve your pain and discomfort. Finally, how about colon cancer? Approximately 150,000 new cases of colon cancer are diagnosed yearly in the United States. Getting a colonoscopy to remove polyps can prevent this cancer. New preparations for cleaning out and anesthesia make you completely comfortable, making colonoscopies much easier to tolerate than your friends might make them out to be. Call us. We can help you with all your GI needs. Contact us at 314.729.1717 and make an appointment. Sanjay T. Bhat, M.D., P.C.